The difference between the first real crossover and most of what followed is that the AMC Eagle was awesome. But so was the Citroën Xantia Break Buffalo 4x4. Think of it as a VW SportWagen Alltrack in 1996, only way more French. 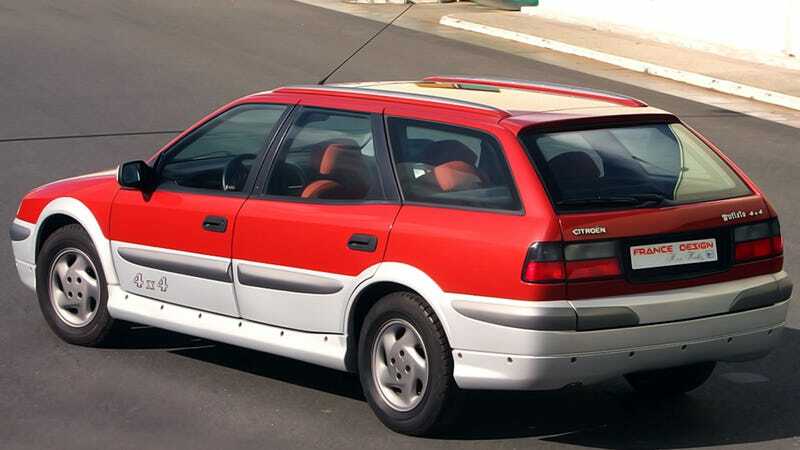 Eccentric coachbuilding genius Heuliez loved turning Citroen’s spaceships into four-wheel drive station wagons, and after doing the BX Break and the XM Break, it was only natural to continue the tradition with the Xantia Estate. Don’t get fooled by those “France Design” plates though as the Heuliez concept used British Ricardo’s permanent four wheel drive system with a central limited slip differential and viscous coupling. They might be best known for putting a transmission into the Ford GT or the Jaguar XJ220, but Ricardo certainly knows how to propel rally cars through the mud as well, so giving the Xantia all-wheel drive must have been a walk in a park. Citroën threw the computer-controlled version of its legendary Hydractive self-leveling suspension and a 2.1 liter turbodiesel into the mix, while Heuliez fitted the wagon with funky body moldings and wrapped its interior in buffalo leather with wool and cashmere detailing. The resulting car was 3,273 pounds of luxurious French practicality. Unfortunately, the Heuliez Citroën Xantia Break Buffalo 4x4 remained a concept, but the company kept building Xantia Breaks for Citroën until 2001. Those looking for buffalo leather trim in the late nineties were reportedly seen leaving Citroën dealerships with a sad face. Photo credit: Heuliez. Hat tip to Julian Marsh via CitroëNët and Carsthatnevermadeit!